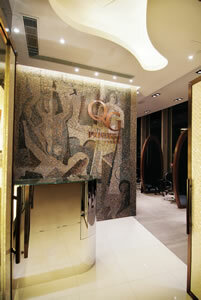 QG PRIVATE i SALON “QG” In French means headquarters, which represents leadership within the PRIVATE i SALON Group. It is located at the 6-stars Four Seasons Hotel in Central. An international flare combines both modern and classic interior styles with emphasis on white and gray colors for a striking contrast. Crystal clear ceiling to floor windows of this exclusive salon highlight the breath taking view of Victoria Harbour. It gives a relaxed and rejuvenated feeling together with a welcoming and comfortable surrounding makes it especially suitable for CEOs, politicians, international travelers and celebrities alike.